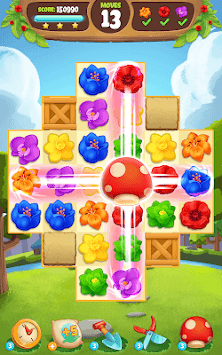 Get ready to fall in love with this amazing flower blasting adventure 🌺 PLAY Flower Burst- the incredible new garden game with plenty of challenging levels, fun puzzles, and colorful flowers. Train your matching skills and discover the best blast game in the play store! Adventure is waiting! Spend the day at the blossoming garden and crash your way to the top overcoming obstacles and challenging puzzles. Unlock amazing boosters and power-ups to help you on your journey, plan your moves and clear the blossom garden to reach high scores. * More than thousands of flowery levels to explore. * Relaxing game to enjoy with family and friends and compete for the highest score! * Addicting puzzles and exciting new quests. * Awesome prizes- spin the wheel and win great rewards! * Amazing power-ups and boosters to help you crush, pop and explode the blooming flowers. * Beautiful graphics and wonderful effects. 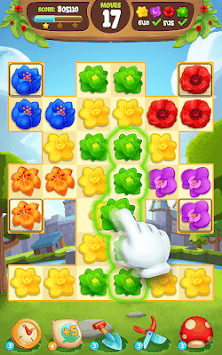 * Super fun flower game to play online or offline- no wifi or internet connection is needed. * Easy to learn: your goal is to swap and match 3 buds of the same kind to smash and burst. * There is no life or time limit, so you can play as much as you like. Looking for an awesome match 3 game? This stunning bloom game is your perfect choice. Play for FREE and enjoy unique gameplay with addictive puzzle levels and amazing elements. Challenge friends and see who can reach the highest score and get three stars on every level- the flowers are in bloom now, and it’s time to start gardening! - Swipe and match 4 flowers to get a horizontal or vertical item of this kind that will create a line blast. - Connect 5 flower buds in an L or T form to get a powerful booster that will create a flower crush. 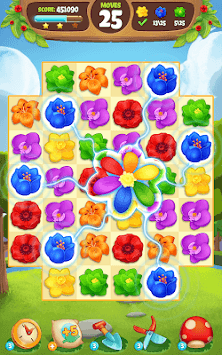 - Match 5 beautiful flowers in a line to get a special colorful bomb that can explode all the buds with the same color. - Combine 2 boosters for even greater explosions! Download Flower Burst for FREE, blast the beautiful buds and experience hours of endless excitement and fun!